Shrikes are a race of towering pale-skinned humanoid Daedra in service to Nocturnal. They have red eyes and resemble female humans, scantily-clad with long hair covering their breasts. They can be found in certain areas of the Clockwork City, especially the eastern region, and within Nocturnal's realm of Evergloam, often accompanied by Gloam Hags, Grievous Twilights, and Whispering Shadow cultists. When in Nocturnal's realm, they appear to possess the ability to turn people into the Night Terrors; which they are seen doing to hapless Whispering Shadow cultists. Shrikes appear very similar to the Nocturnals seen in Battlespire. As Shrikes are sometimes referred to as "Nocturnal Shrikes", it is likely that they are the same type of Daedra. There are three different iterations of the appearance of Shrikes. The first one was very basic: a pale-skinned Imperial-like humanoid wearing a black bra and long dress (added in Update 13, used on Dyzera). 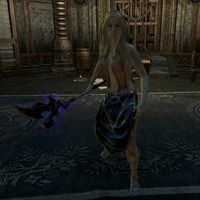 The second is a more unique model, resembling a tall Nord-like humanoid with very long hair, no bra, and a skirt (used as of Update 16). The third is generally the same as the second, but has gray skin with glowing red tattoos and a different color skirt (used as of Update 18). This page was last modified on 21 October 2018, at 06:41.